We wrote on the closing of Yahoo’s ad network sometime last month, and today we wanted to write about Chitika is replacing YPN. Yahoo is actually sending all their old customers over to Chitika. Now whats cool about this is that you can run Chitika and Google Adsense on the same page. That’s been chitika’s “claim to fame”. Chitika an ad agency formerly known for their linx units, as well as thei e-minimalls is company that was founded in 2003, serves over 550 million queries a month. So this is good for people in general. It was against the Adsense TOS to use Yahoo Publisher Network and Adsense together because they looked to similar. Google effectively crushed YPN using this tactic. Chitika on the other hand bloomed as it paid attention to the TOS and build an add company that fits like a glove with Google Adsense. So chitika is effectively replacing YPN. What does this mean? Well this means that Chitika may be the 2nd largest online ad publishing agency in the near future. Just something to think about. 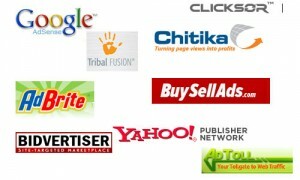 The great list of Google Adsense Alternatives. I’ve decided to make a list of known Google Adsense Alternatives. We’ve used all of the companies sometime in the past 10 years, and here is what we think of them.